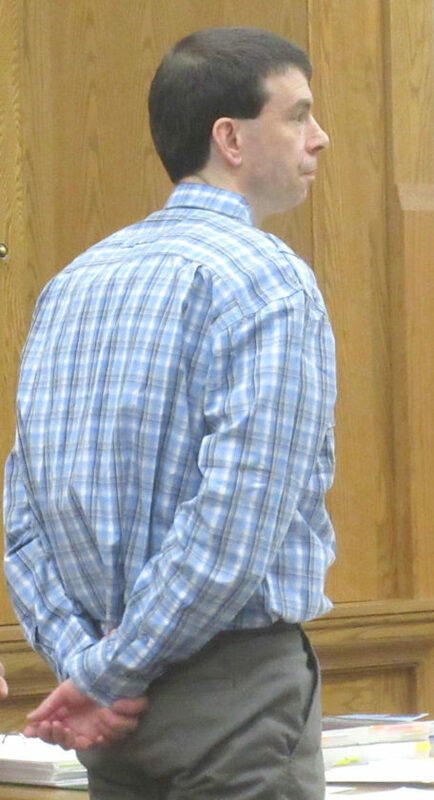 IRON MOUNTAIN — A jury will decide if a Channing man earlier this year assaulted and choked a woman, or if he merely was defending himself in a physical altercation with her. Daniel Cingano Niggeling, 42, is representing himself in his Dickinson County Circuit Court trial on charges of assault with intent to do great bodily harm less than murder or by strangulation, a 10-year felony; domestic violence, a 93-day misdemeanor; operating with a suspended license, also a 93-day misdemeanor; and a habitual offender-fourth status, which increases the maximum penalty on the felony to life. The jury of eight men and five women heard testimony Monday from the woman and saw video footage of Niggeling’s interview with a Michigan State Police detective. The woman testified Niggeling had been verbally and physically abusive to her in the past. She said Niggeling became upset Jan. 8 over an issue with his online business. The two consumed alcohol and marijuana that day and then continued to do so the next day. Niggeling again became upset Jan. 9 over a Facebook conversation with some relatives, the woman testified. She said she decided to get away from the ensuing argument and went to get ready for bed. But Niggeling grabbed her in a choke hold from behind, she testified, and they fell onto the bed. She said she tried to hit him and was able to get out from under him, but he grabbed her throat and pushed her down on the bed and hit her repeatedly. Niggeling then threatened her family as he left the residence, she testified. The woman said she didn’t contact police because she was scared of Niggeling. She testified she went to her friend’s home before talking to officers. She later sought medical treatment for her injuries, she added. Niggeling reportedly took the woman’s vehicle — even though his driver license is suspended — and drove to a nearby cemetery in Channing, where police arrested him, according to the criminal complaint. Niggeling said in his opening argument that “things did go wrong that evening,” but he’s “not a violent or angry person.” He had no intention to hurt the woman and was only defending himself, he said. Niggeling said during his police interview the woman initiated the physical altercation Jan. 9 by punching him in the eye. He grabbed her arm to restrain her and spun her around, causing the two to fall onto the bed, he said. The woman kept trying to hit him, so he put his arm on her neck but immediately let go when she said she couldn’t breathe, he said. He said he got up and she chased him out of the residence, prompting him to take her vehicle to the cemetery. Later in the interview, Niggeling admitted he might have grabbed her arm first before she punched him. But in court, Niggeling suggested the detective used “persuasive interrogation” to get him to change his story. Dickinson County Assistant Prosecutor Alex Sieminski is prosecuting the case, defense attorney Abbey Anderson is acting as standby counsel for Niggeling and Judge Christopher Ninomiya is presiding over the case. The trial is scheduled to run through Wednesday.